"As a kid growing up in suburban California, I was obsessed with the Pacman table in our local Chinese restaurant. I could care less about the myriad stand-up video games in the nearby arcade, but I couldn't get enough of the table Pacman - where instead of playing by yourself you squared off directly against your opponent (in this case, my sister). 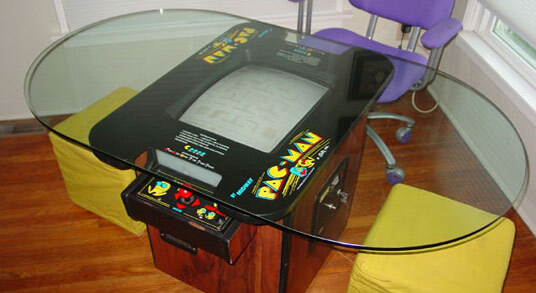 Technology company Grand Idea Studios clearly harbors a similar nostalgia for vintage table arcade games, and has created this Pacman Dining Table, by recycling an old machine into a new use."